Tens of millions of people in the U.S. experience some kind of hearing impairment and recent studies have predicted that over 700 million people worldwide will suffer from hearing impairment by 2015. To address a clear need, the broadcast industry began running captions on regular video programming in the early 1970s. Today, closed captions on video are more prevalent than ever. But generating captions today can be a time-consuming and complicated process. Making video easily accessible is something we're working hard to address at YouTube. One of the first steps we took was the development of a caption feature in 2008. In November of last year we released auto-captioning for a small, select group of partners. Auto-captioning combines some of the speech-to-text algorithms found in Google's Voice Search to automatically generate video captions when requested by a viewer. The video owner can also download the auto-generated captions, improve them, and upload the new version. Viewers can even choose an option to translate those captions into any one of 50 different languages -- all in just a couple of clicks. While we plan to broaden the feature to include more languages in the months to come, currently, auto-captioning is only for videos where English is spoken. Just like any speech recognition application, auto-captions require a clearly spoken audio track. Videos with background noise or a muffled voice can't be auto-captioned. President Obama's speech on the recent Chilean Earthquake is a good example of the kind of audio that works for auto-captions. Auto-captions aren't perfect and just like any other transcription, the owner of the video needs to check to make sure they're accurate. In other cases, the audio file may not be good enough to generate auto-captions. But please be patient -- our speech recognition technology gets better every day. Auto-captions should be available to everyone who's interested in using them. We're also working to provide auto-captions for all past user uploads that fit the above mentioned requirements. If you're having trouble enabling them for your video, please visit our Help Center: this article is for uploaders and this article is for viewers. 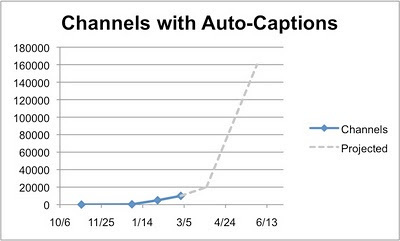 For content owners, the power of auto-captioning is significant. With just a few quick clicks your videos can be accessed by a whole new global audience. And captions can make is easier for users to discover content on YouTube. Twenty hours of video is uploaded to YouTube every minute. Making some of these videos more accessible to people who have hearing disabilities or who speak different languages, not only represents a significant advancement in the democratization of information, it can also help foster greater collaboration and understanding. that's fantastic - at long last, the world of videos is becoming more accessible thanks to auto-captioning! Keep up the good work, Google! We want "Automatic captions on YouTube"( the CC button) to be available on as many videos ( and also many past copies that were uploaded years before ). We need Google to translate for us. "Automatic captions on YouTube"( the CC button) is for everyone around the world. Supposedly, an advertisement produced in American with actors speaking in their native American English. Now, you can watch the same video in its original format and have Google translated it for us in every language around the world. Simiarly, it can be used in many important interviews, talks and discussions. The benefits are enormous.